This entry was posted in Ask the Expert, Child Development, Language Acquisition by Olga Chernomaz. Bookmark the permalink. Q: As bilingual parents, we have chosen to speak mostly Russian to our 2yo. His Russian is progressing very well, he speaks well, even conjugates. At the same time, he enjoys English programming and asks us to read books to him in English, but doesn’t speak it at all (aside from some common household words). What’s the best way (and the best timing) in your opinion to begin introducing English as a (speaking) language? 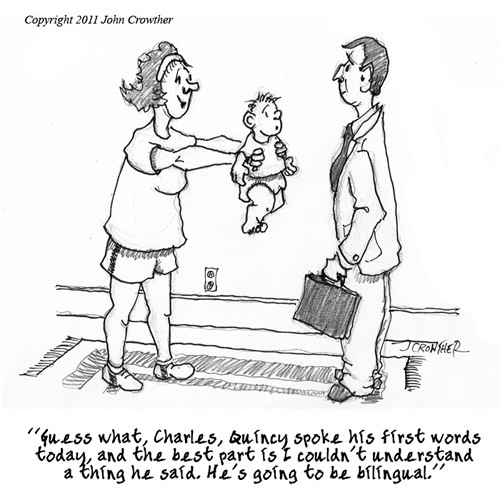 With a normal developing child, you may speak to him in both languages simultaneously. If you ask him a question in English, and he answers it accurately in Russian, you already know that his receptive English skills are developed. You can then ask him to repeat the answer but in English (model it for him if necessary). In my opinion, you can now begin to use English with him more often with simple conversational speech. This way, he will begin to differentiate between the two languages and get into a habit of using both languages when appropriate. Once his environment is primarily English, he will begin to use the English language more often. Q: Our 25 months old understands complex sentences and multi-step commands in Russian, but only has an active vocabulary of under 20 words (about 5 in English; and a few sound imitations such as Moo for cow). I can see that she tries to say some words or say them more clearly, but she can’t pronounce some sounds and gives up soon. What can I do to help her? As mentioned previously, all children develop differently. A 25 month old having under 20 words in her vocabulary is considered normal. Having her repeat the words and withholding items until she repeats something appropriately is one method of building up her lexicon. Another way that you can help her is start off with some easy words. Some words are more difficult to pronounce than others. It may be difficult for her to string certain sounds together, therefore she becomes frustrated and gives up. Simple consonant vowel words are the easiest to pronounce ( moo, cow, she, me, chai, lay). Once she is saying those words clearly, you can attempt to have her practice combining other sounds together by: saying names of members in the family: common household items: daily needs (remember simple combination words). Then incorporate consonant vowel consonant vowel words (bunny, sunny). With these methods, she will not only be building her lexicon, but she will also practice her articulation. Q: How and when should you introduce and teach the English and Russian alphabets? Simultaneously? One at a time? How do you explain to a 2.5 yr old that in one language it’s “p” and in other language “r”? What’s the best routine with most success? This one is definitely tricky. Teaching the alphabets during separately allocated times would be the best approach when the same letter can have different sounds. You child will notice themselves that the letter is the same in a different language. When they tell you the name of the letter in a language different from the one you are learning, remind them that “Yes! You are correct, it is a p! But now, what language alphabet are we using?” (wait to see your child’s response to make sure they know they are now learning Russian) “So in Russian this letter P makes the sound r.” A great resource that I found to be fun, entertaining, and educational for children of all ages is the Russian Azbuka app. It teaches the letters, sounds that each letter makes, and has a little cartoon next to each letter to reinforce the initial sound learned.